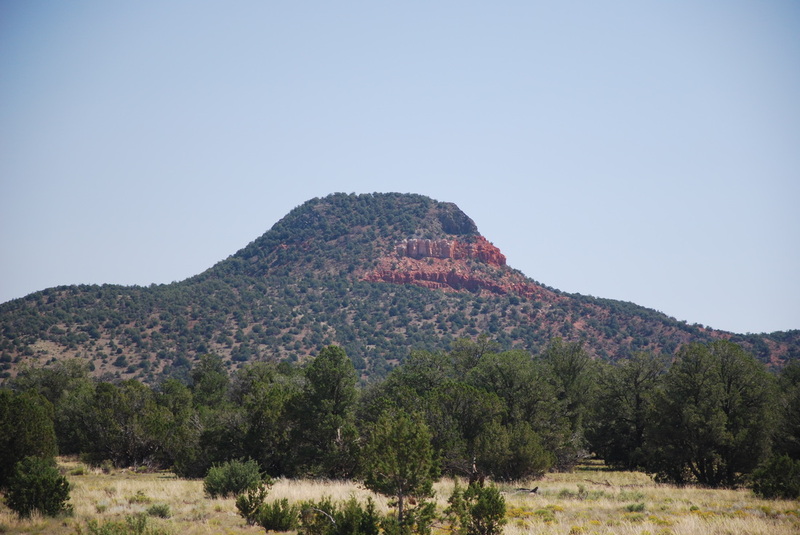 Red Butte is composed of stratified compacted clays consistent with deposition under water. It is on top of the strata of the Grand Canyon, so that the mile of strata below it, Red Butte, had to have been laid down, then washed away before eroding the Grand Canyon strata. 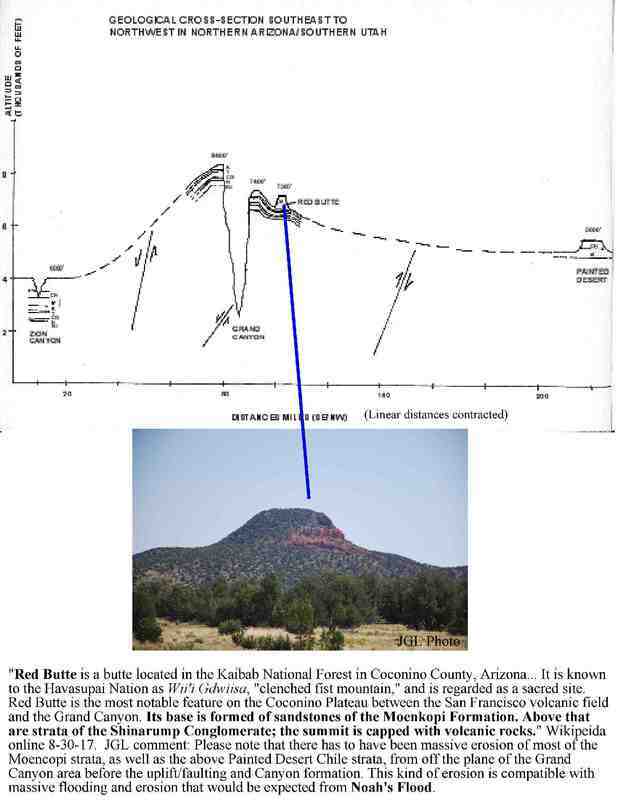 "Red Butte is the most notable feature on the Coconino Plateau between the San Francisco volcanic field and the Grand Canyon. Its base is formed of sandstones of the Moenkopi Formation. Above that are strata of the Shinarump Conglomerate; the summit is capped with volcanic rocks." Wikipedia online 8-15-15. The Kaibab National Forest Service states that their trail starts at "6,460 ft. (1970M) elevation at the trailhead to 7,326 ft. (2233 M) elevation." 8-15-15.Thus it is the remnant of water laden stratified rock raised to almost 1 1/2 miles above sea level and massively eroded.This is of such a magnitude as to be supportive of a worldwide flood scenario. 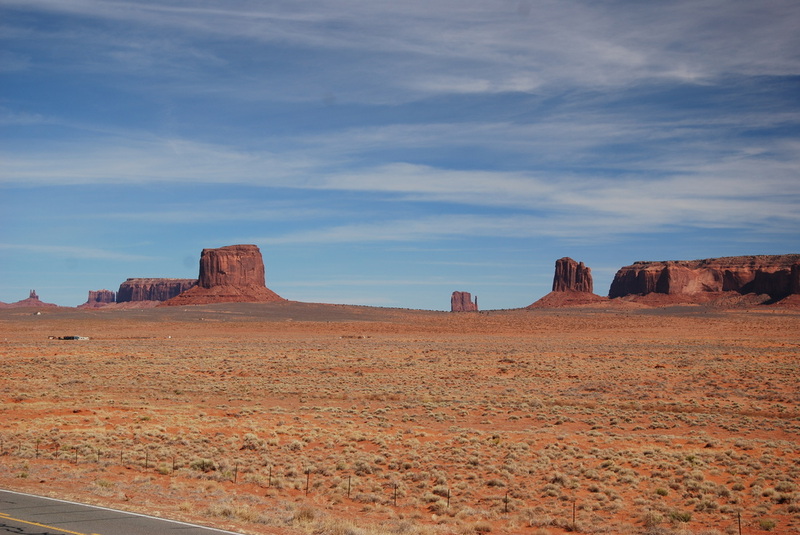 Discussion of Massive Erosion in Monument Valley to be developed. 1) During the Flood there was massive persistent outpouring of moisture from the atmosphere and from within the earth steam(geysers) were released. Genesis 1:11 In the six hundredth year of Noah's life, in the second month, the seventeenth day of the month, the same day were all the fountains of the great deep broken up, and the windows of heaven were opened. 12 And the rain was upon the earth forty days and forty nights. 2) Numerous volcanoes also spewed large amounts of ash into the atmosphere and this cooled it by deflecting light back towards the sun. This would have allowed large and continuous snowfall upon the earth for months-which created huge snow packs. Genesis 1:11 all the fountains of the great deep broken up, and the windows of heaven were opened. It is a reasonable assumption that the process by which massive geysers spewed water into the air, over the entire earth, was related to volcanic activity. Numerous observations of glaciers link their formation to volcanic activity (see many references on the internet). 3) The increased cooling would have led to an eventual cooling of the oceans and less evaporation. As well, the volcanoes would have subsided-and the glaciation process would have largely decreased-but with glaciers remaining and beginning to melt. Genesis 1:19 And the waters prevailed exceedingly upon the earth; and all the high hills, that were under the whole heaven, were covered.20 Fifteen cubits upward did the waters prevail; and the mountains were covered...Genesis 8:2 The fountains also of the deep and the windows of heaven were stopped, and the rain from heaven was restrained;3 And the waters returned from off the earth continually: and after the end of the hundred and fifty days the waters were abated.4 And the ark rested in the seventh month, on the seventeenth day of the month, upon the mountains of Ararat.5 And the waters decreased continually until the tenth month: in the tenth month, on the first day of the month, were the tops of the mountains seen. Note:The partial melt and temporary refreeze of the edge of glaciers can lead to complex formations still consistent with one, and not many, glaciation periods. What Caused the Ice Age?